The beginning of this Firewatch review will be spoiler free, followed by a spoiler section later on. Reviewing indie games is tough. More than with a big budget release, you can feel the warmth of the blood that was pumped into every vein of a smaller title. 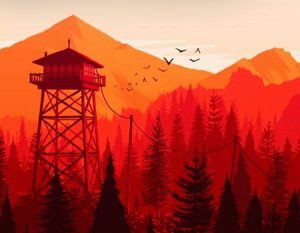 Like the orangey-red palette that permeates the skies of Firewatch’s Wyoming mountains, independently released games exude a passion not normally seen in a blockbuster title. Campo Santos, the team behind Firewatch, is an 11 person team made up of developers and designers from smaller, less independent studios like Double Fine. Reading through some of their development blog, you can begin to get a glimpse of the stress involved with putting out a finished product. That’s why it pains me to say that after pushing through Firewatch in one night, I cannot recommend it as an actual game. That being said, those looking for an escape from a lost loved one or a recent breakup may appreciate the story, setting, and minimalist gameplay. With Firewatch, the two biggest headlines surrounding the game center around the value of the game and the open storyline. Press was made about a gamer who requested a refund on Firewatch after saying it was too short for the price. I am not even going to justify this ridiculousness with more than a sentence, but will say that Firewatch is a short, story-driven experience. I don’t want to get too involved in the intricacies of the story in this segment of the review (there is a spoiler section for a reason), but I do want to discuss my reactions to the game’s telling of the story and the base plot. 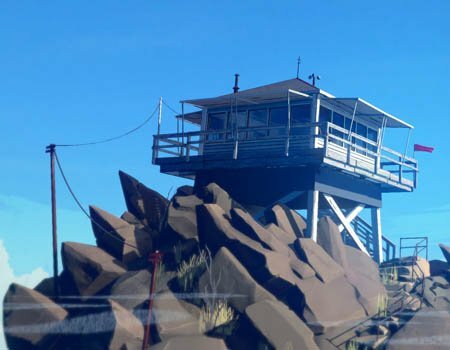 In Firewatch, you play the role of Henry, who has accepted a job as an outpost firewatch for a summer after his wife, Julia, has come into some unfortunate life circumstances. These circumstances tested the boundaries of their marriage. In these Wyoming mountains, Henry meets Delilah, another outpost firewatch who communicates with Henry via walkie talkie. If you haven’t played the game yet, you might be coming to this review, as I did to others, for opinions on what to expect of the story. I was surprised to turn on the game and be invited by basic text and text prompts. There is the occasional cut to your character in the woods in the introduction, but for the most part, you are making simple choices and reading about what has happening in your character’s life. “What conversations do you have with those in your life? What type of person are you?” — All is selected with text. What follows is a fairly simple system of communication with a girl from another outpost and a bunch of half-baked ideas. In one playthrough you will explore, danger, mystery, romance, adventure, comedy, and more, but you will never fully realize any of these emotions. The game starts a lot of thoughts and doesn’t finish any of them. It makes no sense. The ending also has an unfinished feeling. There are spoilers further down, and I can understand after completion why some loose ends don’t get wrapped up, but I left the experience feeling pretty underwhelmed because of it. If I was a “big-time” game journalist right now, I would not know what to do with a game like Firewatch. While I enjoyed the overall character interaction, visuals, and pace, I did not have any fun playing the thing! I suppose an “IGN” or a “Gamespot” could give it a positive review based entirely on the story, but then they are not reviewing a game anymore. They are reviewing an art movie. The game fulfills the purpose of putting you in the role of a character and giving you control over his actions, but beyond that does nothing to resemble a game. Not only does the game fail to be anything more than a cool looking story, it has other issues as well. Graphics don’t mean everything. Sometimes a visual style is all a game needs to stand out from the crowd or to be a beautiful game. Case in point, Super Meat Boy, a game that came out 20 years after it was supposed to with an old 8-bit look but tons of style and flair. 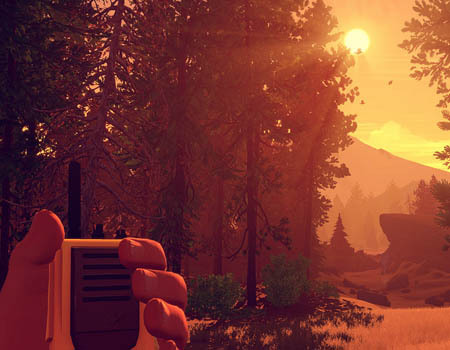 Firewatch resembles Team Fortress 2 with a colorful and cartoony yet adult aesthetic. As mentioned at the beginning of the article, it plays with color in a cool way. And while it doesn’t have the most technically impressive graphics ever, who cares? Normally I wouldn’t mind, but there are so many technical issues with the game (I played on Playstation 4) that I can’t ignore them. I’m not sure if I missed an obvious PS4 install or not, but the game takes quite a while to load. Considering we are dealing with one map that doesn’t truly persist (I noticed many occasions where things I did on one day were overridden the next), I am not sure why these load times were not diminished. Beyond load times, there were constant moments where textures and objects in the world would pop in right in front of the character and there were just as many times where the game would slow down to a crawl. Controls were also not very tight. I found myself easily missing interaction prompts and running into edges in the environment that barely seemed there (you can’t jump). Interacting the environment wasn’t always cooperative, and some of the button design wasn’t very intuitive. Holding the L2 button, while using the D-Pad to move, while simultaneously moving with the left analog stick is not very friendly to the hands. You might argue this is not intended, but it is possible to do, so there’s no excuse there. I realize I have been putting the hammer down hard on the little indie title. I don’t want to sound like Firewatch is the worst abomination in the past 25 years of gaming either. There is plenty to like. Music in the game is nice enough and provides good ambient direction to the various twists and turns of the game. One of the developers on the game previously provided music for other games, like Don’t Starve (a game “ironically” with a good deal of similarity to Firewatch). Voice work is also well done, which is good considering it makes up most of the core “gameplay.” Even though the characters and environments are cartoony, the voices add realism to the very real tales of relationship woes and lost opportunities. In closing, I simply do not think Firewatch is worth the $20 price tag if you are looking for a fun game to play. It’s a shame, because a small team of talented and passionate developers spent years making it. In the 3-4 hours it took to complete the game, I feel as if I did nothing but watch a mildly entertaining movie. If you want to see where gaming storytelling is going, I would recommend the purchase. WARNING: After this point, the content of this review will contain spoilers of the game, the game’s ending, and the themes of the game. The story is impossible to discuss in the reviews other than to say that it is almost refreshingly sparse. 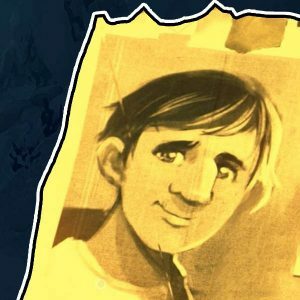 While I did not enjoy playing the game, I think the story line is worth discussing, since it is so different from a lot of other indie experiences. I wanted to start at the end with the Firewatch ending. The entire game is told through walkie talkie conversations between Henry and Delilah. At the end of the game, your area of the forest is consumed in flames and you need to evacuate to the nearby outpost — Delilah’s outpost. After spending the last few hours learning about Delilah through conversation and pointless choices, it is time to meet her. Except you don’t get to. By the time you arrive, she has already been carried away in a helicopter, away from the fire. From here, you have the option to hop aboard the next rescue copter and fly to safety or stay in the fire and debris and die. There is no payoff. In this way, Firewatch succeeds in telling a “real” story. You don’t always get what you want. Sometimes, there is no payoff. The ending of the game ties directly into the relationship between Ned Goodwin and his son Brian. Firewatch let’s you decide if you want to dwell on the past or rise to the occasion. When I first finished Firewatch, I wasn’t a big fan of the flow of the story. Nothing really happened and everything was totally out of my control. In addition, the story kept jumping around, and there was a weird mystery in the middle involving the father/son team of Ned and Brian Goodwin. Yet, when I stepped back and thought about the story from a distance, the similarities between protagonist Henry and Ned Goodwin began to make sense. Ned Goodwin lost his son Brian through no fault of his own (a climbing accident) and never recovered, getting “lost in the woods” and blaming everything and everyone for something outside of his control. Likewise, Henry has come to the same forest to escape his wife’s early and severe contact with dementia. From the title screen, Firewatch lets you make many pointless decisions. But all real decisions are left out of your control. You are not always the hero of time. You will sometimes fail and sometimes things will happen beyond reason or understanding. It’s what you do to survive these incidents that makes you who you are. Firewatch explores that with a no frills story, and that’s pretty cool. 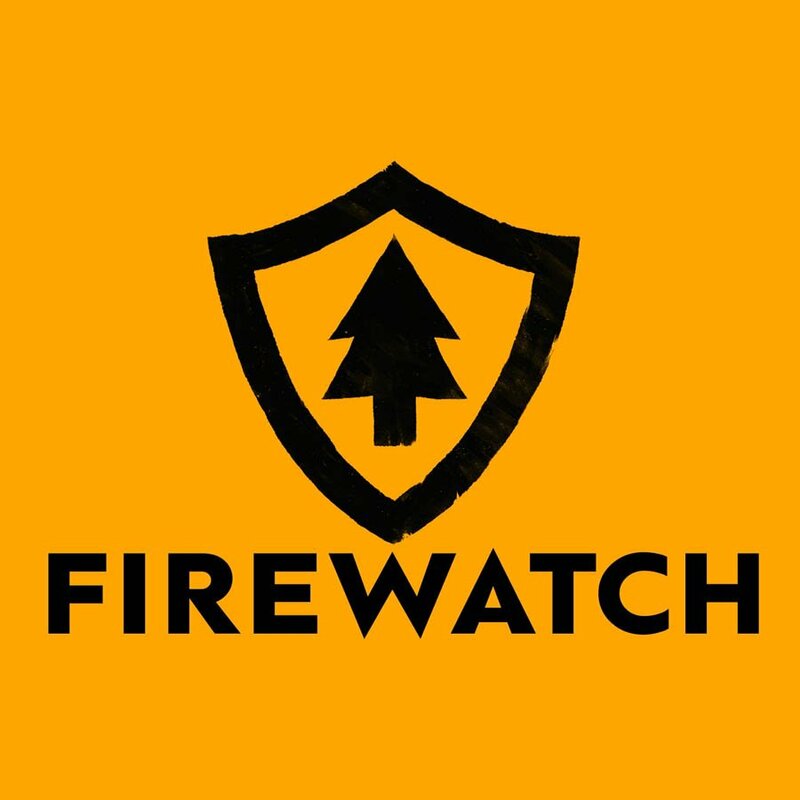 What did you think of Firewatch? Do you disagree with my thoughts? Did you like or dislike the story and ending of Firewatch? Let your voice be heard, in the comments below! We purchased a copy of the game ourselves.